Myocardial perfusion images are combined with exercise to assess the blood flow to the heart muscle. You may be asked to exercise by walking on a treadmill. If you’re unable to perform the exercise required, we may perform a chemical stress test using medicine which can provide similar information about the hearts blood supply. These tests can identify areas of the heart muscle that have an inadequate blood supply as well as other areas of the heart muscle that have been scarred from a heart attack. This technique also assesses the extent of the heart muscle with limited blood flow and can provide useful prognostic information on which to base treatment plans. Radionuclide ventriculography is a noninvasive study which provides information about the pumping function of the heart. 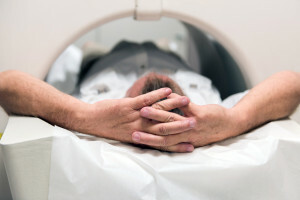 A small dose of an imaging agent is injected into the bloodstream and images are recorded of the pumping chambers of the heart using a special nuclear camera. The overall pumping function of the heart or ejection fraction which is the amount of blood pumped out of the heart during each beat is recorded. This is expressed as a percentage and a normal ejection fraction is between 50 and 70%. The ejection fraction provides very powerful prognostic information and has major diagnostic and treatment implications. It is also used to assess the effects of treatment in heart failure patients and to monitor the effect of different drugs on cardiac function in chemotherapy patients. PET studies are noninvasive and are used to provide information about both the blood supply to the heart muscle and the metabolic activity of the heart. These studies can outline the heart muscle that is not getting adequate blood flow because of blockages in the arteries of the heart. These studies can also determine the heart muscle that has been scarred from heart attacks as well as the muscle that is damaged but has potential to recover if a stand or bypass surgery is performed.